This paper lays out a strategic vision for the newly created economic development agency for southern Ontario—FedDev Ontario. The recommendations in this paper emerge from two companion research pieces by the authors which assessed the successes and failures of Canadian regional economic development policy in the past and the new approaches to economic development occurring in the European Union, the United Kingdom and the United States. Five specific lessons for Canada emerge from this research, leading to recommendations for FedDev Ontario. This paper lays out a strategic vision for the newly created economic development agency for southern Ontario—FedDev Ontario. The recommendations in this paper emerge from two companion research pieces by the authors which assessed the successes and failures of Canadian regional economic development policy in the past and the new approaches to economic development occurring in the European Union, the United Kingdom and the United States. Regional economic development (RED) is increasingly less interested in equalizing outcomes between regions through top-down inter-regional redistributive programs that try to lure businesses to less prosperous regions. Instead, successful RED invests in the strengths of all regions, particularly those assets that can be mobilized to create competitive advantages for the region globally. This approach is “place-based” and embedded in local communities and networks that cross sectors and government departments. Five specific lessons for Canada emerge from this research, leading to recommendations for FedDev Ontario. RED agencies should invest in the innovation related assets of each region, rather than in regional redistribution. Particular emphasis should be placed on investing in local assets that cannot be easily replicated or moved. Policy alignment across levels of government and sectors to maximize returns and exploit local synergies and regional strengths is crucial. In practice this means that FedDev should invest in high-performing partnerships, joining industry and educational institutions, venture capitalists and commercialization incubators, anchor firms and spin-off entrepreneurs, and skills centres and business associations. Institutionalizing collaborative governance is critical for success. A range of public and private actors, including provincial and municipal governments, must be formally involved in the process. So long as RED agencies are embedded locally and networked externally, they can serve as the focal point in the multi-level governance system and help establish formal contractual agreements between actors. In southern Ontario, FedDev is only one of many actors in the RED space. As such, it must attempt to invest in transformative projects. A “Go Big or Go Home” approach should aspire to introduce high-impact interventions that address next generation challenges and seed solutions to transform businesses and communities. In Ontario, these should complement key provincial strategies for economic growth, such as investing resources around clusters of strength such as knowledge economy corridors and eco-industrial clusters. Finally, FedDev Ontario should benchmark progress against goals and encourage policy learning across regions, agencies and communities. To ensure RED spending brings about positive and enduring change, government measurement and reporting must be rigorous and transparent. In Canada, cataloguing RED successes and failures, reporting on these and learning from them has been insufficient in the past. If Canada is to get the most bang for its RED buck, measurement, reporting and learning must become part of the institutional culture of RED agencies. 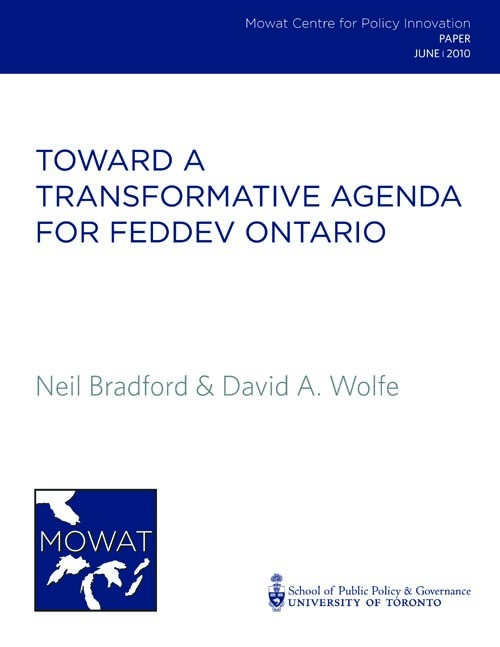 The strategic vision and recommendations outlined in this paper could enable FedDev Ontario and Canada’s other regional economic development agencies to play an important role in the transformation and economic success of many communities across Canada.